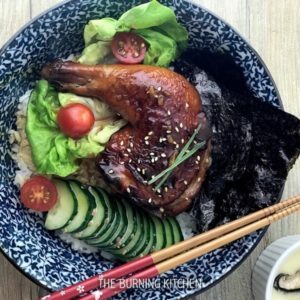 Instead of heading to a Japanese restaurant, why not make this easy 30-min Teriyaki Chicken Don at home? The homemade Teriyaki sauce uses just 3 ingredients and gives a beautiful glossy finish. Yummy and and easy to make! Wash the Japanese rice and drain dry. Then place the rice in a rice cooker and add 1.25 rice cups of water, then set to cook. Use the coarse salt to exfoliate the skin of the chicken, then wash thoroughly and pat dry. In a pan, add the sugar and fry over medium heat for about 8 minutes or until it becomes sticky and caramel coloured. Place the chicken legs skin side down and move them around the pan until they are evenly coated with caramel. Then add in the light soya sauce and 0.5 bowl (or 170 ml) of water. Cover the pan and let simmer for about 15 minutes or until the sauce thickens. Stir the chicken occasionally. Meanwhile, wash the Japanese cucumber and slice it. Then place it in the fridge. Cut the Japanese seaweed into strips, and set aside. Once the rice is cooked, transfer into a glass bowl and place it in front of a fan. Then add in the salt and 3 tbsp of Japanese rice vinegar (a little at a time), all while stirring the rice with while hot until well mixed. Don't forget to check on the chicken as well. Next, add in 3 tbsp of mirin and turn the chicken thighs over. Then continue to cook for 3 mins or until the sauce becomes sticky but not too dry. You can add more water if it is too dry. Then transfer it to a plate. Scoop the rice in 2 rice bowls and top with the teriyaki chicken thighs. Sprinkle with sesame seeds, shredded seaweed and assorted chili pepper and serve hot. You need to understand the stages of the sugar caramelising, so you can control the fire accordingly. Stage 3: Next, sugar will melt and turn light golden brown like honey. Stage 4: The liquid will start to thicken and turn a darker brown. Once this happens, reduce the heat and stir continuously until it turns sticky and caramel coloured. Do not leave the sugar solution unattended as it can burn quickly. Once you reach stage 4 (sugar turns caramel brown), put in the chicken thighs immediately. If you continue to cook the sugar on its own beyond stage 4, it will quickly turn dark brown / black and will have a burnt taste. If you put the chicken in too early, it won't give you the nice brown caramel colour. Ensure that the sugar is properly caramelised before you place the chicken into the pan. Ensure that the chicken is placed skin-side down, and that you press down on the chicken to evenly coat it with caramel. Ensure that the simmering liquid has reduced into a thick sauce during the 15 minutes fo simmering. If not, your fire may not have been high enough, and you will need to continue to simmer the chicken for a couple more minutes until the sauce turns thick and sticky. Exfoliate the chicken with coarse salt to help remove the yellow lining on the skin. If not removed, you may notice that the chicken has a strong poultry smell after it is cooked. Adjust the amount of soya sauce accordingly, as some brands of light soya sauce are very salty. Do check out my article on the Essential Chinese Sauces I stock in my pantry for recommendations on sauce brands! Stir the rice with chopsticks to minimise breakage of the cooked rice. Stir the rice in front of a fan so that the rice will absorb the vinegar better. Fanning also helps to cool the rice down faster for easy handling and to give it a glossy look. Transfer the rice into a glass bowl before adding the vinegar. Vinegar is acidic, so its not advisable to add it to the rice in the metal rice-cooker pot. Add a little sugar to the rice if it is your preference to have sweeter rice. If sugar is added, you need to heat the vinegar and add in the sugar until it dissolves before adding to the rice. Once you add the mirin to the rice, consume it within the day. If you plan to make this dish ahead of time, allow the rice to cool after it is cooked, then refrigerate it. The next day, you can reheat it in the rice cooker, and add the mirin and salt to the dish as per the recipe instructions.